Nontoxic foam floor best play mats are ideal for babies who spend most of their time on the floor playing. These safe mats provide a conducive environment where babies aged 6 months and above can begin to sit up and train how to crawl. Kids can also use them to roll, toddle and play. Some of them are colorful and do resemble fleece blankets. These mats are designed to provide comfort and protection. They usually prevent the child from slipping on the floor. You can use them literally in any area such as the baby’s nursery, bedroom, play rooms or living rooms. They are made of different designs and patterns. They are soft, lightweight and portable. They are also easy to clean and store. Their soft material is usually safe for your child to safely crawl on, keeping their skin soft and comfortable without bruising their wrists or knees. There are easy to carry along wherever you go because of their portability feature and the fact that they are also fold-able. 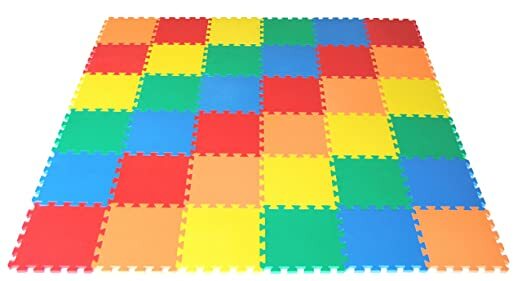 Colored Mats are visually pleasing to the adults and provide plenty of entertainment for kids. They come with colorful pictures including vibrant as well as stimulating colors that capture and attract your child’s attention. Here are some of the colorful designs available online. This durable foam Pingko mat provides a soft cushioned surface for kids to play on. It is reversible – one side with graphics and alphabet and the other side with the animals. It has been tested to European Toy Standards and is free from latex, lead, phthalate and BPA.It is thick, only one piece that lays flat on the floor without the middle or ends sticking out. It doesn’t have removable parts e.g. numbers or letters. It does not absorb spills. It is waterproof, shock-absorbent and also nonskid. It is not machine washable but easy to wipe clean sponge or hand wash. This large mat measures 82.7 inches in length by 55.1 inches in width by 0.5 inches in thickness. It is ideal for babies who are learning how to crawl and above and can also be used as a yoga mat. This thick colorful mat is made of high density, durable nontoxic, EVA foam. It is lightweight, waterproof, easy to clean wipe and does not absorb stuff that spills on it. Each mat has 36 interlocking pieces each measuring 12 inches by 12 inches. These pieces are easy to assemble, lock together and do not fall apart. The 36 pieces cover an area of 36 square feet. The mat has one smooth side and the other side is textured. You can use the textured side facing up for better grip and to prevent slipping. You can use it for kids from 6 months of age and above. The colors are vibrant and bright. The material is non-sticky and will not collect pet’s hair. It has passed substances of very high concern screening and also ASTM standards. 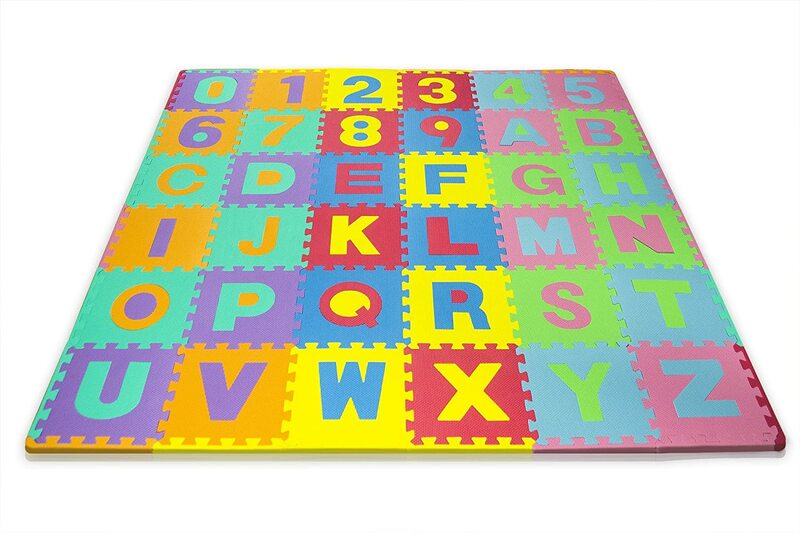 Some of these playmats are educative as they do come with characters, numbers or alphabets. The pictures and the numbers designed on the mat can influence learning and help your child to develop their knowledge right from infant stage before they enroll in school. 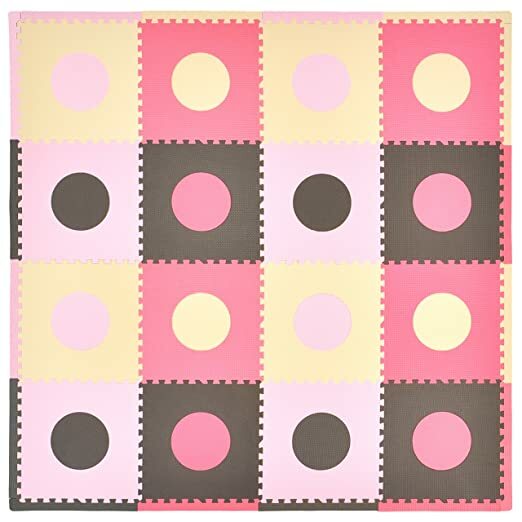 These mats are ideal for for Children’s Playrooms and Nursery. Here are some for you to check out. 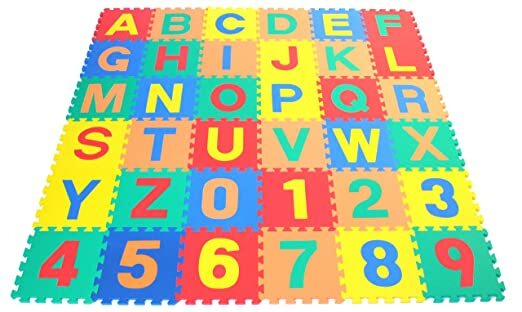 This is a thick educative mat containing numbers 1 to 10 and the full alphabet. It is made of high-density EVA foam. Each mat comes with 12 interlocking squares each measuring 12 inches by 12 inches with a thickness of 0.375 inches. This 12 piece mat covers an area of 36 square feet. You can make it smaller or bigger depending on the space you have just by adding or removing tiles. It is well cushioned, washable and comes with straight borders that give it a finished appearance. When not in use you can stack each square on top of another. It is ideal for kids aged 3 years and above It is not recommended to be used on carpets. This fabric mat is large, thick and portable. It is made of cotton/polyester material. It is colorful, soft, less absorbent and ideal for both outdoor and indoor use. It is machine washable, easy to fold and comes fitted with carry handles.It comes with engaging accessories including a detachable mirror and an attached foot-shaped, blue teething ring. The top surface has different textures. It measures 39 inches long and 59 inches wide providing room for the parents to sit and baby to play. Ideal from one-day-old infant and above. It has stimulating colors that capture the child’s attention. It is well padded to protect your child from hard surfaces. 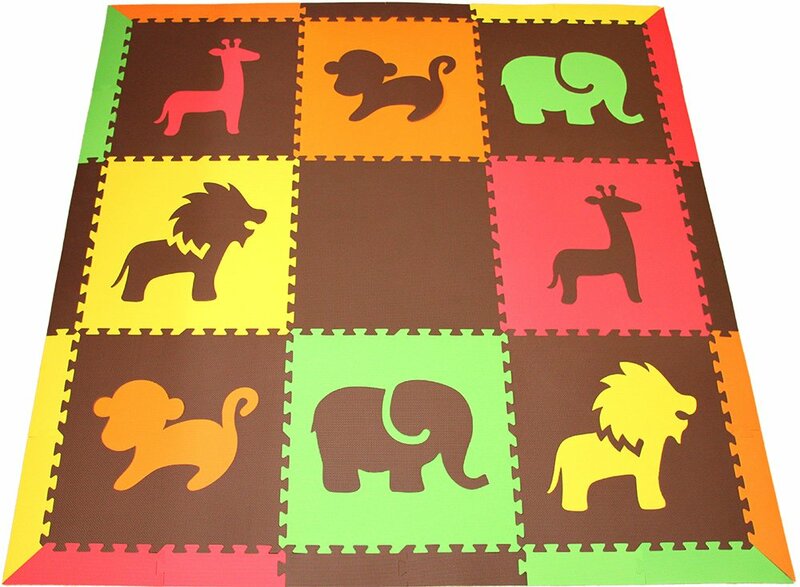 This engaging play mat is made of polyester material. It is soft with bright colors and animal characters. It is easy to fold and also machine washable. You can use it both indoors and outdoors. It comes with engaging accessories including a fish teether, mirror, including a frog with clackers. Its top surface has different high contrasting patterns that usually enhance the kid’s visual skills. It measures 58 inches long and 40 inches wide with a thickness of 0.5 inches. It is lightly cushioned and ideal for use only on a soft surface such as plush carpets or on the grass when used outdoors.Recommended from Birth to 18 months of age. The best mats should be waterproof to protect your child from chilly floors, from bacteria and germs. They should be made of a non-toxic material that is safe for babies. They should be free from toxic materials such as latex, phthalate, BPA, and lead. They should also be well cushioned to protect your kid from hard floors in case they fall while playing and also to provide a good grip. They should be made of a material that is slip resistant and one that helps to reduce impact and noise.